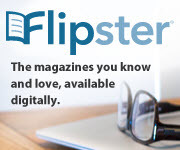 Flipster is your one-stop-shop for Digital Magazines. It allows you to browse the latest or back issues of our most popular magazines and download them to either your computer or tablet. Flipster is easy to use, download the free app to your favorite device to read anywhere offline. Check out times are seven days for monthly magazines and two days for weekly ones.